Children love to play and enjoy treats, and few occasions provide better opportunities for them to do both than birthday parties. There is also no mythical creature known to help children revel in friends and fun more than El Papa. According to legend, he is little and round and brown, like a potato, with dark eyes and beard. He wears white overalls and a round hat. He has a huge grin. Autumn claimed to be one of the few who could see El Papa, and he liked to visit her once in a while. Because he was immortal, El Papa had all the time in the world. To him there was never need to rush or hurry. He only wanted to make the most of any moment, and he encouraged others to value time the same way he did. He gave great advice. “Can’t we get there any faster?” Autumn said. “I’m driving as fast as I can,” her father said. Finally, Autumn arrived at the home of the birthday girl, Juanita. It was a hot sunny afternoon. Autumn handed Juanita a birthday present, and Juanita handed Autumn a popsicle. “Daddy, may I eat the popsicle?” Autumn said. Although Marshall preferred his daughter didn’t eat sweets, he agreed. Autumn ate the popsicle, and then she ran wild with her friends in a bouncy house. Marshall joined some parents on the front porch, and they watched their children play. As time passed, more guests and treats arrived. Juanita’s family rolled a cotton candy maker onto the driveway, and the children lined up for the pink, fluffy sweet. “Daddy, may I eat some cotton candy?” Autumn said. Autumn ate the cotton candy, and then she ran wild with her friends in the bouncy house. As time passed, the sun crossed the sky and was preparing to set. The party was scheduled to end, yet it seemed to be just beginning. More guests, and treats, arrived. The atmosphere became so festive it was easy for Autumn to get carried away. She slipped by her father with a bottle of fruit punch in her hands without even asking if she could drink it. Marshall snagged the fruit punch and replaced it with water. “This will keep you hydrated,” he said. Autumn was too excited to complain. Marshall was not. He and some parents on the porch began glancing back and forth at their children and watches. Marshall crept next to Autumn and whispered in her ear. But Marshall’s voice, it seemed, was not the only one whispering in her ear. At that moment, a lady wearing a pink dress and golden crown appeared. The children gathered around her in a circle. The lady began making balloon dolls and swords, doling them out slowly to good girls and boys. “I want a balloon!” Autumn said. “Of course you do,” Marshall said, rolling his eyes. The moment to escape had passed. Autumn joined the circle and waited patiently with the other children. Marshall returned to the porch and also waited. And waited. And waited. A half hour later, he and Autumn continued to wait for her to get a balloon. Marshall crept beside his daughter and whispered in her ear. Autumn was tired and cranky. Marshall realized the sweets and the heat finally were getting to her. He reached for Autumn’s arm, to usher her toward his car, when he heard a voice inside his head. So, Marshall returned to the porch and waited. And waited. And waited. An hour later, he and Autumn continued to wait for her to get a balloon. Autumn glanced away from her father. She was so absorbed in thought it seemed like his must not have been the only advice she was considering. Marshall watched his daughter’s eyes drift toward a group of friends. They were playing in the bouncy house. Some had balloons, but some did not, and those who did not, did not seem to mind. They were too busy having fun to worry about what they didn’t have. She stood and broke away from the circle. She ran wild and free, once again, immersed in her time with her friends. Long after sunset, a lone white balloon shaped like a sombrero slipped through the princess’ hands. It floated across the yard and onto Autumn’s lap as she flopped out of the bouncy house. Many guests, Marshall included, seemed surprised. Some clapped. But not Autumn. It was as if she expected it. She took a bow and donned her white balloon sombrero. There was a round of laughter. “Does this mean we can go now?” he said. “What about the birthday cake?” she said. Autumn stared into her father’s eyes; they reflected her fatigue. Autumn reached up for her father. He lifted her into his arms and carried her away. “I love you, too, sweetheart,” he said. Marshall was so touched, his eyes welled up with tears. Autumn had a magical way of knowing just what he needed to hear. On the nights Autumn stayed with her father in his apartment, he told her a bedtime story, and then she fell asleep in his bed next to a big stuffed frog, which she called Bob. He had a pink heart. Later that night, after reading a book or watching a movie, Autumn’s father, Marshall, joined them. And that’s how it was, for years: Marshall slept on one end of the bed next to Autumn, who slept in the middle of the bed next to Bob, who slept on the other end of the bed. And while Autumn and her father were close, Autumn and Bob in some ways were closer. “We share the same dreams,” Autumn said one night as Marshall put her to bed. And the three did, until Chloe started spending the night, too. She not only often joined Autumn and her father for Daddy Day, she sometimes stayed until the next morning. Autumn remembered the first time. She woke up with her father to one side, as usual, but Chloe was on the other. Bob was nowhere to be seen. “This is so surprising!” Autumn said, playing with Chloe’s poofy hair. “You had a sleepover?” Autumn said. “Yes, is that all right?” Chloe said. Autumn quickly learned, however, that sleeping in bed with her father and Chloe was a little different than it had been with her father and Bob. There was less room in the bed, because Chloe was larger than Bob. Everybody was squished. One day, Autumn arrived at her father’s apartment, and it wasn’t only his anymore. It had plants and books and crystals and blankets and spoons. Chloe was moved in. “Is all of this stuff yours?” Autumn asked Chloe. “It came from my apartment, but now it’s all of ours,” Chloe said. “Are you going to marry Chloe?” Autumn asked her father as he put her to bed. 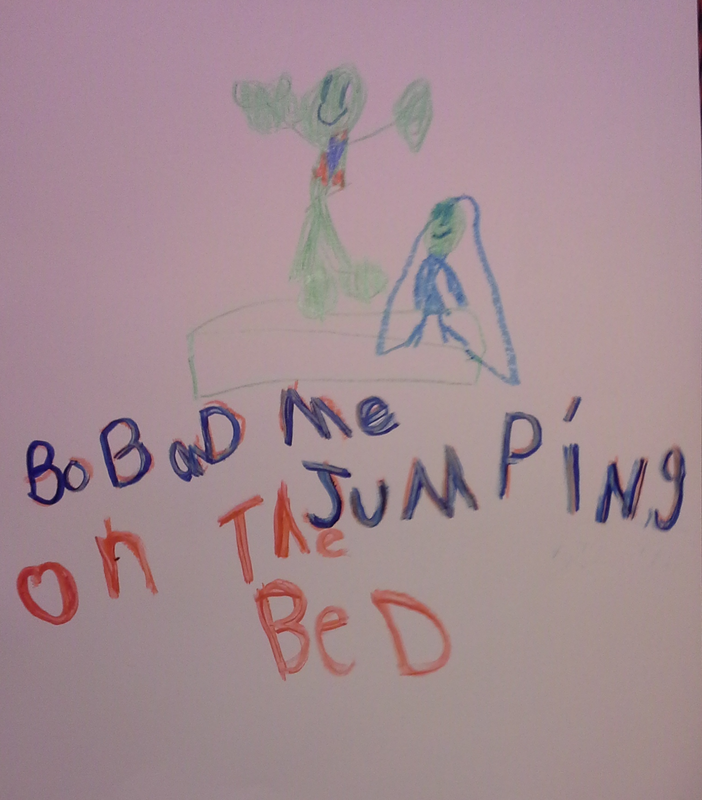 That night, Marshall told Autumn a bedtime story about her and Bob’s first adventure leaving the rainbow town. It involved a treasure hunt on a flying carpet for magic cupcakes that gave Autumn and Bob super powers. It was such an exciting story, Autumn and her mystic friend dreamed about it together all night. When Autumn woke the next morning, she was sleeping in a new bed. Because she often was bored during car rides, Autumn liked to play games to pass the time. During the drive to her cousins’ house one Sunday, Autumn played Story Clouds. In this game, passengers take turns telling stories about the images they see in the clouds. Marshall, her father, glanced out the window. Marshall saw the red flash of brake lights as cars stopped ahead of them. He applied his brakes, and the car he and Autumn were riding slowed down. It was stop-and-go traffic on the freeway as far as Marshall could see. Autumn sat in her rear car seat and watched silently as the alien spaceship approached. To her it looked like a giant hamburger, a meal her father always wanted her to try but she was always too afraid to do so. She only liked eating the bun. Autumn knew. The alien spaceship hovered above their car, and people were excited. 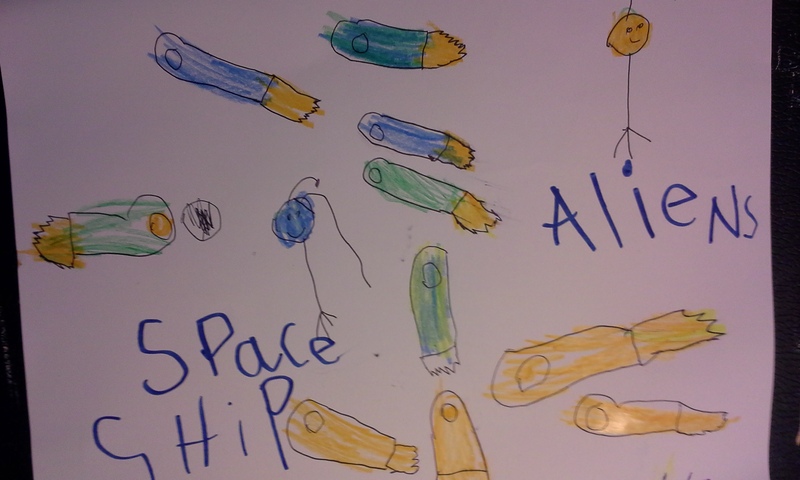 Everyone wanted to meet the aliens, even Autumn. Finally, the cars began moving again and didn’t stop. As Marshall continued to drive, Autumn noticed the spaceship fly past the freeway toward the hills where her cousins lived. Autumn’s aunt, Misty, and her cousins, Star and Krystal, were happy to see Autumn when she arrived. Autumn, Star and Krystal decided to play on the trampoline in the backyard. They unzipped the safety net, climbed aboard, and began to jump. Autumn told Star and Krystal about the alien spaceship she saw on the freeway. They didn’t seem impressed. It was a good question, but Autumn had an even better answer. She sprang toward Star and whispered in her ear. Star, Autumn and Krystal laughed. They jumped around the trampoline in circles, pretending to be aliens chasing each other. Aunt Misty called them to the patio table. It was time for lunch. Star and Krystal piled their patty with cheese, lettuce, tomato and pickle. They squirted ketchup and mustard on their bun and swirled it together with a butter knife. They began to eat. Autumn was a little jealous, but not enough to do the same. Since Star and Krystal were so busy with their food, they didn’t notice what Autumn did with hers. Autumn gave her patty to Sabina, the old family dog, who fetched it from Autumn’s hand and disappeared around the corner. Aunt Misty returned from the kitchen. “Done so soon?” she said to Autumn. “I guess the alien ate her food,” Star said. Star explained to Misty Autumn’s fascination with the aliens. “Maybe they came here to make you eat your food,” Aunty said. “Yeah, if that were true, would you still say aliens are real?” Star said.